Firstly, I apologize for the oversight of Blaster Blade's Vanguard ability in my review yesterday but as you could see in the other reviews which dealt swiftly with the point was that it isn't the most efficient of his uses. Today, I won't make the same mistake because now I have King of Knights Alfred open in a Wiki Tab and will be constantly checking it through out this review to make sure I'm not forgetting something. Reviewing King of Knights Alfred after just reviewing Blaster Blade is just as fitting as it was to have Blaster Blade lead off the premiere of the COTD section yesterday, the reason being (for anyone who is not well unacquaintated with the lore) is that Blaster Blade is the right hand man of Alfred. He was also the poster boy for the very first Cardfight!! Vanguard Booster Set and why wouldn't he be with that intimidating armor riding upon majestic flaming stallion that is rearing it's head while swinging his double edge meat cleaver. Alfred is a Grade 3 with a base 10000 Power, which is okay for the current English Meta. It's neither particularly great nor particularly bad, just okay. Upon our first inspection of his overwhelmingly threefold skill text, we are greeted with a restriction that doesn't let us boost Alfred while he is on the Vanguard Circle which is a bit concerning but somewhat softened by the fact that a Twin Drive adds the pressure of a potential Trigger so his power is virtually 15000 on the Vanguard Circle, which at times can be underwhelming against any Vanguard with a static 11000 power (or higher). 10000 base power, King of Knights, Alfred true power lies within the oncoming storm that exists in “Booster Set 5: Awakening of Twin Blades” which is to have it's English Debut in late February. In Set 5, Three particular noteworthy cards exist, two of these cards have a static 11000 base which is already a problem for many decks but addition to that when they fulfill certain conditions, which aren't too hard to do in a practical manner, they gain a static +2000 increase in power. Stop and think about it for a moment. Done thinking? Okay, what that means is they are the first cards in existence to have a static power above 11000. You know those Godzilla-esque films were a new beast comes rampaging and terrorizing a city and the military always (I mean ALWAYS) gets called in to shoot it down but to their dismay all of their weapons are useless against this undocumented threat. That's basically what these new cards are to Vanguard, the usual way to fight has to be refined and we are essentially birthing the idea of Anti-Meta to Vanguard. With these troop of Godzilla cards reaching 12000-13000 static power, we can't rely on the usual method of a Grade 3 Unit that is 12000 on Attack with a conditional 9000 power booster to create a Stage 3 Column which ascertains that these new decks won't need to guard the extra potential 15000 Total from three separate hits from Stage 3 Columns. The best way to deal with this, other than joining them, is to forget about hitting Stage 3 altogether and focus on quickly and constantly assembling Stage 2 Columns. Finally we're back to King of Knights, Alfred his true power lies in the fact that he can reach 18000 without the need of a Booster simply by setting up, hopefully just as potent, columns on the Rearguard circle. There also exists the hidden bonus of conservation here whereby a Player who doesn't need to play that additional Vanguard Booster Unit has essentially just conserved himself a 5000 Shield, against a deck that's conserving up to a potential 15000 Shield each turn (if not more) shortcuts of field set up and backwards advantage like this are very much welcome and I daresay necessary to keep up with Godzilla, King Kong and the Loch Ness Monster. Finally, after that long trip in the previously mentioned oncoming storm, we are back out into the clear and can look at Alfred's last skill. For the expensive price of Counter Blast 3, you may Superior Call any Grade 2 or lower Royal Paladin from your deck, this has some nifty plays such as calling a Blaster Blade to retire a Unit (for a total of +2 in advantage, ignoring conservation and whatever auxillaries potentials you messed with) or High Dog Breeder Akane who can go into another Unit to grab yourself an entire Column out of the play or Alfred could even go into Pongal who could go into Soul Saver Dragon to set up for a finishing blow for their next turn. Of course each of these would run you of essentially all your counterblast outside of checking a Heal Trigger and for that reason alone it's usually ignored in the favor of using extra High Dog Breeder Akanes, Blaster Blades or Pongals but is always handy to keep track of in case of emergencies. Regardless, even if King of Blondes, Blondie isn't officially overpowered or broken, it is quite no surprise that it got restricted in the Japanese format. 4/5 (5 being broken. Run without question. 4 being very Good, questionably powerful). (Apologies if my Wall of Text squished you). The King of Knights, Alfred leads the United Sanctuary as her monarch and is the figurehead leader of the Royal Paladin clan. Unsurprisingly, he's one of the most unique and flexible bosses in the game. As a Grade 3, 10000 base power is a little on the low end, as it renders one susceptible to the numerous means of reaching 20000 total power in the rear-guard, not to mention the midling columns of 15000 everyone and their mother can form. Alfred also cannot receive boosts while he's in the Vanguard Circle, so his offensive power cap is considerably lower than some of the more modern cards. In exchange, Alfred gains 2000 power for each of one's Royal Paladin rear-guards during their turn, and this adds up quickly! With a modest field of 3 rear-guard units, King Alfred enters the fray with 16000 power - enough to convince opponents to let his attack through until the late game. If the field is full? 20000 strikes fear into fellow 10000 base units. It's best to leave the slot behind him vacant in most match-ups for the sake of conserving potential guardians, but the best way to use it is with Lake Maiden, Lien or an excess Grade 3. Alfred has another nifty ability. Whether he's in the Vanguard or Rear-guard Circles, a somewhat hefty counterblast of 3 grants access to any Grade 2 or lower Royal Paladin from the deck, which of course serves to feed his Vanguard-only power buff. It's a nice safety net to fall back on if other, more economical units like High-Dog Breeder, Akane don't make an appearance to fill up the rear-guard, or if their scope of recruitment doesn't suit the situation. Without a more viable, moving First Vanguard than Brugal, Alfred is having a bit of trouble keeping up with the rest of the game, but expect that to change with the release of Wingal Brave in Awakening of Twin Blades. His simple and quick-to-mobilize beat down strategy just might be the bane of the up-and-coming terrors. 3/5 right now, 4/5 post-BT05. 1. “Your units cannot boost this unit.” This is a Vanguard-only skill, so he makes a viable Rear Guard, but due to his other skill, this is an almost meaningless restriction, although with newer cards coming out, this is slowly invalidating him. 2. “This unit gains 2000 Power for each of your Royal Paladin Rear Guards.” This is the skill that has kept him relevant since the dawn of the game. A full field allows him to attack for 20,000 Power every turn, which draws 15,000 Power of guard from a 10,000 Power Vanguard for a simple 1 trigger to pass. With 11,000 Power Vanguards, however, he is slightly less effective, but still forces 10,000 Guard for a 1-trigger to pass. As most boss units are becoming 11,000 Power now, and 10,000 Power Vanguards are getting rarer and rarer, this 20,000 Power is slowly losing its potency. However, the biggest aspect of this skill that has kept him alive is the fact that with 4 Rear Guards he is 18,000 Power, which forces 10,000 Guard from Crossrides, some of the most potent and powerful units in the game. 3. “Counterblast 3: Call 1 Grade 2 or lower Royal Paladin Rear Guard from your deck.” This skill can be used in the Vanguard OR the Rear Guard slot. That’s right. The ability to recruit nearly anything from the deck no matter what zone you put him in is insane. It works in tandem with his second skill to increase your number of Rear Guards, thus making him stronger on the offensive. Since Royal Paladin is a toolbox deck, you can easily use this skill to call something that does something else; Call a Blaster Blade to retire an opponent’s unit, or call a High Dog Breeder Akane to call a good booster. Alfred is a behemoth. He only has one major flaw, so I'll cover that first: his defensive capabilities are not great since he is only a 10k vanguard. But he makes up for it in a myriad of ways. His first ability is a bit strange. When he's in the vanguard circle, he can't be boosted? What? Of course, that's where his second ability comes in. During your turn as the vanguard, he gets +2k for each other Royal Paladin on your side of the field. So, with a full field (not very difficult with Royal Paladins), Alfred swings for a respectable 20k, forcing 20k worth of guard out of your opponent for two to pass if they have a 10k vanguard. "But," you say, "vanguards with 11k or higher defense aren't really affected that badly by a 20k attack!" And that is true. But that is another area in which Alfred finds himself versatile and useful. That is to say, against 11k or even 13k vanguards, you can get away with never having to commit any cards to the spot behind your vanguard because Alfred simply doesn't need it. With four rearguards, Alfred swings for 18k, which may not be as threatening as the previously mentioned scenario but is certainly nothing to scoff at when considering the versatility Alfred offers and the pure strength of Royal Paladin rearguards. His third ability is yet another effect that simply refuses to compromise. 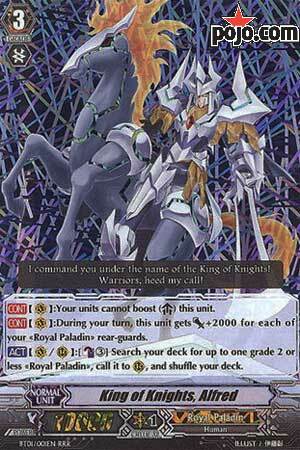 For three counterblast, he can superior call any grade 2 or less Royal Paladin from the deck. Yet another testament to Alfred's ridiculous versatility and consistency. Normally, 3 counterblast for a +1 would be considered expensive, but in this case you are paying one extra for the convenience and quality, which is more than welcome. Not only does this effect allow you to fill the field to hit the numbers you want Alfred to hit, but it also allows you to fill any holes in your field that need filling, and if that wasn't enough, Alfred doesn't even need to be the vanguard to use this ability. Nope, it can be used from pretty much any circle whenever you want. Pretty great. If you're using Royal Paladins, there is almost never a reason not to consider Alfred in your deck. Here we have yet another Royal Paladin and the image card of the game’s very first set. Alfred exemplifies the Royal Paladin theme of selectively searching out units from the deck and gaining power from allies. Though he does have some marked flaws, he was and still is one of Royal Paladin’s best Grade 3s, and his rather flexible abilities can give him a place, if not as the main Vanguard, then as a nice tech option in Royal Paladin decks. Although I do wonder why, if Alfred is the king, that Blaster Blade was depicted more as a leader and gets more of the cool stories and support cards. In the Vanguard slot, Alfred can’t be boosted. But that’s perfectly okay, because he gains +2K for every Royal Paladin in a rearguard circle when he attacks, and thus can hit for the same decently high power level turn after turn. This gives you a lot more flexibility, as at this point you won’t even care how weak or strong any unit behind Alfred is, and in some cases, if one even exists at all. And if you happen to have a Lian behind Alfred, you can basically filter your hand every turn without hurting your offensive abilities either. That’s definitely a beneficial ability. Unless the opponent’s Vanguard is also a 10K on defense, however, Alfred may not be quite as powerful in the long run as other Royal Paladin Grade 3s. Alfred’s second skill is also pretty appealing: It allows you to Counterblast 3 to call any Grade 2 or lower Royal Paladin from your deck. This usually means any rearguard you could possibly want aside from (sadly) Palamedes, with Gordon being a fairly popular target for his intercept. It’s a rather heavy cost in a deck that already likes using Counterblasts, but is justified by its status as an ACT skill and its sheer flexibility in getting you exactly what you need while thinning your deck. Although this is really weird for a non-Megablast Vanguard-oriented unit, the superior call can also be used by Alfred on a rearguard circle, which makes him even more flexible and techable. This is an option worthy of consideration. Rating: 4/5 – Not very remarkable on offense or defense, has a rather heavy cost in an already Counterblast-heavy deck, but he has incredibly stable power and one heck of a tutoring skill. Basically exemplifies flexibility. Some believe he is based Alfred the great who was the first king of the west Saxons and was know for improving the UK's Military structure (hence King of Knights). Alfred for a time was considered the main character's trump card. The first thing you notice about this Unit is that he can't be boosted, but reading its other effects will help you understand why. So it gets +2000 power for each royal paladin rear guard, so with a full field he will be a whopping 20k power. Although you normally wouldn't have a unit behind him (making him 18k) so he would be the equivalent to any Grade 3 vanguard with 10k power and an 8k booster. Its counterblast effect lets you call out a royal paladin from deck and this can be used on the rear-guard and vanguard circles, this is what Royal Paladins are mostly know for. This can allow you to get his power up to the standard 18k or to set up your other columns for more powerful attacks. A classic combo with him is to call his disciple Blaster Blade and go in for the finishing blow. Trouble is even though he is a good card there have been better options released since him, he is still often used as a 1 of card though. As for the art it doesn't impress me that much. His armour is overly complicated with the pauldrons pointing up so much as it seems they were trying too hard to make him look different to Blaster Blade. And with the angle its hard to see his cape. But I give the artwork a 3/5.